Fleetwood head coach Uwe Rosler says he made a half-time double substitution to make a statement after Town’s dismal first-half display in their 2-1 defeat at Rochdale. Right-back Conor McLaughlin and right midfielder Victor Nirennold were both withdrawn at the break after Dale had a whale of a time down that side. It was 1-1 at the time, Bobby Grant’s 23rd-minute penalty having trickled over the line to cancel out Matthew Lund’s 10th-minute header. Michael Duckworth slotted in for McLaughlin and Eggert Jonsson came on as Rosler reshuffled his midfield, Kyle Dempsey moving over to the right side. Town put in a better shift only to be rocked by another late goal. 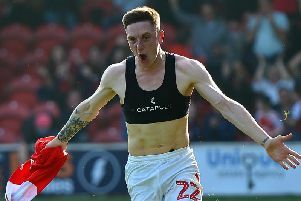 Joe Bunney’s cross from the left was misjudged by Town keep Chris Neal and unmarked substitute Steven Davies nodded home five minutes from time to seal a first win of the season which lifted Dale off the bottom of League One. And Rosler says he could have made eight substitutions at half-time, such was the standard of his side’s play. The Town boss said: “I saw a side in the first half that I have not seen so far. “The contrast between the first seven league games and the eighth was massive in the first half. As for that double substituion, he explained: “I needed to set an example. “I think the standard we showed in the first half was not acceptable for us coaches, for the players and our supporters. “Conor was on a yellow card already and he struggled. I could have made eight different substitutions. “I needed to make two to send a signal to get us back into the game and I think it worked because the second half was much better. “Both substitutes did well and they helped us get back into the game. Town have slipped three places to seventh.